When Larry Kirshbaum, the longtime head of TimeWarner Publishing (purchased right after he left in 2007 by Hachette and now the company called Hachette Book Group USA) joined Amazon many people thought — I among them — that Amazon was about to become a threat to take big titles away from the major publishers and, by doing so, also put pressure on competing retailers who would either have to buy from Amazon or do without major books. An article last week in The Wall Street Journal spells out just how futile have been Amazon’s efforts so far to upend the Big Six. Their two biggest headline acquisitions — a celebrity bio from actress Penny Marshall and the latest from bestselling non-fiction writer Tim Ferriss — are achieving paltry sales outside Amazon as measured by BookScan. Michael Cader does some deeper digging to suggest that the high-profile books are not the place to be looking for the successes in Amazon’s publishing. They’re publishing lots of genre fiction and buying up some backlists. Yet, I can’t believe that the high-profile output from the New York office meets Amazon’s original expectations or Kirshbaum’s. If they miscalculated the impact they could make, maybe it was for the same reason I did. An abrupt slowdown in ebook switchover took hold at about the same moment the Kirshbaum era at Amazon began. Big publishers are reporting that ebook sales are now approaching 30% of their revenue, which is about a 50% increase from what they said last year. That follows several years when ebook uptake increased by 100% or more. Amazon as a publisher has advantages and disadvantages against more traditional competitors. They have the advantages of direct customer contact, which pay off in two ways. They can send you an email pitching a book as the logical next one to the one you just read; general publishers can’t do that. And, as the publisher, they have more margin to either pay the author more or charge the customer less, which, either way, increases an author’s revenue through online channels. But their disadvantages are also significant. For most books, and particularly non-fiction (as both of which the high-profile releases the Wall Street Journal wrote about are), more than half of the sales still come from brick-and-mortar stores. Despite their attempt to secure that exposure by a licensing deal with Houghton Harcourt, the resistance to Amazon from Barnes & Noble and many independent stores and mass merchants has curtailed that distribution. Apparently Amazon led at least some people to believe with their success on the recent Barry Eisler book that they could sell more copies through their own channels than big publishers could through the entire network. The claim that they had outsold all his previous NY Times bestsellers was made to literary agents in a letter that also cited other great successes, all with genre fiction. Without questioning anybody’s numbers, I was skeptical about the significance of the relative Eisler sales because, it seemed to me, whatever they could do for Eisler (whom they published) they could do for any other book they wanted to, whether they published it or not. So it seems illogical to me that they would somehow magically sell more than the whole trade combined on a book because they were publishing it. It seems apparent that Amazon isn’t succeeding at persuading agents that the Eisler case, even if it is as portrayed, is replicable. I saw reports of bitter comments from Tim Ferriss, complaining about Barnes & Noble’s apparently-effective boycott of their competitor’s publishing program. Maybe he would be doing that even if Amazon is selling more than his conventional publishers did before. But I doubt it. This is not a final answer. Amazon’s share of the trade market — ebooks and online print combined — is still growing and shows no sign of abating. Most publishers would still report that Amazon is their fastest-growing account. But shelf space erosion — a metric with no reliable index anywhere — seems to have slowed down. That means that, at the moment, we have a more stable book trade than we’ve had for at least five years. It is smaller, but it is more stable. In the US at least, our market of three big ebook players (Amazon, B&N, Apple) and two sturdy and persistent upstarts (Kobo and Google) is still welcoming some new entrants. Zola eBooks, promising some interesting merchandising innovations, and Bookish — the repeatedly postponed effort from three major publishers — are expected to join the fray soon. Sony and Copia and Blio are still trying to gain traction, but they’re also still here. Amazon definitely has the most advantages. 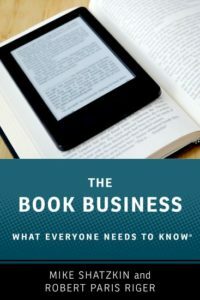 Their Kindle ecosystem is still the best-functioning, deepest in title selection, and benefits in numerous ways from having more readers and selling more ebooks (and books, for that matter) than anybody else. The growth in their genre title base that Cader points out increases their market share of dedicated genre readers, who read other things too. They have the most self-published titles and the best ecosystem for self-published authors to make money. And the big title growth enables them to build subscription or subscription-like capabilities like KOLL (Kindle Owners Lending Library) which do take customers out of the game for everybody else. As their share of the market grows — as long as it continues to grow — their argument to authors to cast their lot with them gets stronger. But, for now, it would seem that B&N definitely did the right thing for their own good by boycotting Amazon’s titles. And, for now, it would seem that most of the authors Amazon will get for their general list will be those who are annoyed at the publishing establishment like Konrath and Eisler or curious about working with a tech-oriented publisher like Ferriss. Authors who want bookstore exposure or to maximize their total sales across the US bookselling universe will remain hard to persuade for the forseeable future. But probably a little less so with each passing day. I note with sadness the passing of Senator George McGovern. I am proud to have worked on all three of his presidential campaigns: 1968 at the Democratic National Convention working for Pierre Salinger, two years on the 1972 campaign, and a weekend in New Hampshire trying to light a fire in 1984. What motivated us to join Senator McGovern was primarily his opposition to America’s involvement in Vietnam, but his personal and political appeal went far beyond that. He was extraordinarily decent and straightforward. In my stretch of two years working for him in the early 70s, it was remarkable how consistently he took issue positions we young idealists could be proud of. A poorly-vetted choice for vice-president will always be part of the explanation for why he was crushed, but my friend Professor Wade — one of McGovern’s top strategists — told me years ago that it was the assassination attempt that crippled George Wallace that actually was responsible for the defeat. Nixon had won the 1968 election with a little over 40% of the vote. Wallace had taken a share in the high teens. The McGovern planning from the beginning assumed a similar race in 1972. When Wallace was eliminated by the assassination attempt, Nixon’s “Southern Strategy” made him the heir to the Wallace vote and a landslide victory. In the end, of course, it was Nixon’s vice-president, Spiro Agnew, who went to jail and his administration that ended in disgrace. McGovern was always gracious and never bitter. But, as a country, we’ve never spent enough time contemplating how different things could have been if Bobby Kennedy hadn’t been shot in 1968 or if McGovern had won in 1972.